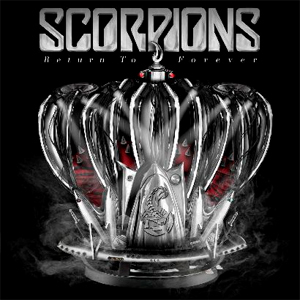 German rock icons SCORPIONS have announced that to coincide with their 50th anniversary celebration, the group will release Return To Forever, a new album, on February 23rd in Europe. For the occasion Klaus Meine(vocals), Rudolf Schenker (guitar) and Matthias Jabs (guitar) have found old demos to rework, arrange and refine. These "forgotten songs" also feature current band members James Kottak (drums) and Pawel Maciwoda (bass). The result is Return To Forever, a bright disc that perfectly reflects what SCORPIONS do best: direct and melodic hard rock with choruses that are unstoppable and, of course, beautiful ballads. As Previously announced, the SCORPIONS will embark on an extensive 50th anniversary world tour, launching in spring 2015 and running will into 2016.